Gordon Frickers, a Marine Artist, has proven a popular, entertaining guest speaker. Gordon Frickers has proven to be an engaging, amusing, immensely knowledgeable and often surprising speaker and lecturer on many occasions. His style is interactive, approachable, the talks usually illustrated, he has an international perspective. His appearances have varied from 20 minute intros to 10 x 2 hour “lectures / classes” as “adult education” and as a celebrity guest of Cunard Lines. You can reach him via our Contact Us Page. The South West Branch of the Nautical Institute were privileged to welcome as guest speaker to its January meeting, Gordon Frickers, a marine artist of considerable talent and reputation who commenced his career as an artist in the early nineteen eighties. Today he paints many marine subjects including historical vessels, racing dinghies, commercial ships and warship. Gordon’s interest in marine subjects began in his infancy. He later trained as a boat builder, learning his craft at Falmouth Technical College. He still practices his skills in construction, maintenance and restoration of craft. His love for boats and ships can be seen in the art work which he produces. He claims to ‘paint for people who really understand the sea and the unique qualities of ships and boats’. Nothing better exemplifies this than his famous painting the “Roaring Forties” commissioned by Sir Robin Knox Johnson showing the “Suhaili” in storm conditions. More recently his involvement with the Trafalgar 200 celebrations and his paintings “Trafalgar Dawn” and “Urgent Dispatches” show his talent in being able to recreate historical events with accuracy and sense of atmosphere. Of local interest is Gordon’s painting of “Tectona“, the former training vessel of Plymouth’s School of Navigation. Gordon provided the meeting with a short history of marine art which covered three and a half thousand years. 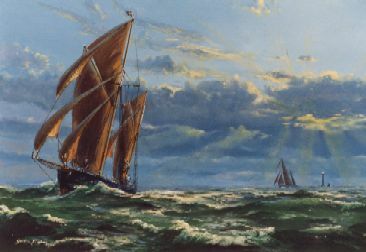 It commenced with paintings illustrating the Egyptian Pharaoh royal barges and ended with contemporary marine artists such as Thomas Summerscales and John Stobart. Gordon also illustrated how some of his present work has involved commissions to paint modern ships which he declared “have character”. A fine example is his painting of the cableship “Nexus” produced for the boardroom of Coe Metcalf. Unlike photography, artists have the freedom to use colour, to leave in or leave out what is observed and create a canvas which captures mood and character. It was interesting to learn that the English painter JMW Turner who loved to visit Plymouth and Devon was one of Gordon’s early heroes and an inspiration to him when he was a student. Art is about communication feeling and the recording of events and issues of the day. People at the beginning of the early part of the twenty first century are concerned about climate change – a subject which Gordon described as being a fabulous subject for artistic development. Those who attended the meeting could not fail to be impressed with the expertise, skill and knowledge of Gordon Frickers – and the quality of his artistry. It was a great evening, enjoyed by all who attended.